Bosch Nutsetter Bit, Magnetic, Series: ITNS, 1/4 in Drive, 1/4 in Shank, 1-5/8 in Overall Length, Steel, Black Oxide, Gray Handle, Impact Tough Hardness Full cone threaded tip provides the speed needed to drill faster by pulling the bit through the material with Features a full cone threaded tip for fast drilling, contoured paddle for fast chip removal, hex shank power groove to reduce slippage and spur and reamer tips for cleaner holes. Use in applications such as drilling in hardwoods, composites, treated lumber, railroad ties and other wood products. Made of shock resistant tool steel for maximum durability. Hardened core for extra strength and reduced breakage and stripping. Heat treated to resist breakage and wear; 1/4" hex shank. For power driving hex head screws, bolts and nuts. Design reduces rounding of the hex. Advanced hardening process provides max. durability. Extra strength magnets provide strong bit retention. Standard hex shank fits most power drill chucks. 1-7/16'' long. Heat treated shaft resists bending under heavy loads. Angle dimples scoop the wood to drill cleaner and faster than conventional spade bits. Heat treated shaft resists bending under heavy loads. Angle dimples scoop the wood to drill cleaner and faster than conventional spade bits. Bosch Nutsetter Bit, Magnetic, Series: ITNS, 3/8 in Drive, 1/4 in Shank, 1-7/8 in Overall Length, Steel, Black Oxide, Gray Handle, Impact Tough Hardness Blue groove point and cutting edge for faster chip removal, double cutting spurs scribe the outside of the hole reducing breakout. Grooved hex shank prevents slipping in drill chuck or bit extension and fits all standard quick change chucks. Full cone threaded tip provides the speed needed to drill faster by pulling the bit through the material with Features a full cone threaded tip for fast drilling, contoured paddle for fast chip removal, hex shank power groove to reduce slippage and spur and reamer tips for cleaner holes. Use in applications such as drilling in hardwoods, composites, treated lumber, railroad ties and other wood products. Forged tips create a stronger and more flexible torsion zone, reducing breakage and extending bit life. Hardened cores increase bit strength and reduce fracturing. Ideal for fast, easy driving of nuts, bolts and hex head screws. Rugged single piece construction. Long life under constant use. Precision formed tip ensures proper fit. Lobular nutsetters are built for maximum durability, performance and long life with impact tools. Designed to drive the fastener from the side, rather than forcing the corners to turn, maintaining the true shape of the fastener and dramatically reducing breakage and damage from stripping. Also provides more clearance on the corners of the fastener where paint build-up often occurs. Black oxide finish resists corrosion to increase the life of the nutsetter. Made of shock resistant tool steel for maximum durability. Hardened core for extra strength and reduced breakage and stripping. Heat treated to resist breakage and wear; 1/4" hex shank. Heat treated shaft resists bending under heavy loads. Angle dimples scoop the wood to drill cleaner and faster than conventional spade bits. Heat treated shaft resists bending under heavy loads. Angle dimples scoop the wood to drill cleaner and faster than conventional spade bits. Lobular nutsetters are built for maximum durability, performance and long life with impact tools. Designed to drive the fastener from the side, rather than forcing the corners to turn, maintaining the true shape of the fastener and dramatically reducing breakage and damage from stripping. Also provides more clearance on the corners of the fastener where paint build-up often occurs. Black oxide finish resists corrosion to increase the life of the nutsetter. Full cone threaded tip provides the speed needed to drill faster by pulling the bit through the material with Features a full cone threaded tip for fast drilling, contoured paddle for fast chip removal, hex shank power groove to reduce slippage and spur and reamer tips for cleaner holes. Use in applications such as drilling in hardwoods, composites, treated lumber, railroad ties and other wood products. Heat treated shaft resists bending under heavy loads. Angle dimples scoop the wood to drill cleaner and faster than conventional spade bits. Lobular nutsetters are built for maximum durability, performance and long life with impact tools. Designed to drive the fastener from the side, rather than forcing the corners to turn, maintaining the true shape of the fastener and dramatically reducing breakage and damage from stripping. Also provides more clearance on the corners of the fastener where paint build-up often occurs. Black oxide finish resists corrosion to increase the life of the nutsetter. Blue groove point and cutting edge for faster chip removal, single pointed spurs scribe the outside of the hole reducing breakout. Grooved hex shank prevents slipping in drill chuck or bit extension and fits all standard quick change chucks. Forged tips create a stronger and more flexible torsion zone, reducing breakage and extending bit life. Hardened cores increase bit strength and reduce fracturing. Ideal for fast, easy driving of nuts, bolts and hex head screws. Rugged single piece construction. Long life under constant use. Precision formed tip ensures proper fit. Heat treated shaft resists bending under heavy loads. Angle dimples scoop the wood to drill cleaner and faster than conventional spade bits. Made of shock resistant tool steel for maximum durability. Hardened core for extra strength and reduced breakage and stripping. Heat treated to resist breakage and wear; 1/4" hex shank. For use in impact drivers and wrenches; industrial strength magnet maximizes fastener retention. Impact ready socket adapters can withstand up to 2000 in. lb. of torque; for high torque applications. For use in impact drivers and wrenches; industrial strength magnet maximizes fastener retention. Impact ready socket adapters can withstand up to 2000 in. lb. of torque; for high torque applications. Proprietary steel and heat treat process for maximum strength, durability and a strong magnetic tip for secure grip. Color coded band for easy size identification; 1/4" hex shank Lobular nutsetters are built for maximum durability, performance and long life with impact tools. Designed to drive the fastener from the side, rather than forcing the corners to turn, maintaining the true shape of the fastener and dramatically reducing breakage and damage from stripping. Also provides more clearance on the corners of the fastener where paint build-up often occurs. Black oxide finish resists corrosion to increase the life of the nutsetter. For use in impact drivers and wrenches; industrial strength magnet maximizes fastener retention. Impact ready socket adapters can withstand up to 2000 in. lb. of torque; for high torque applications. Blue groove point and cutting edge for faster chip removal, double cutting spurs scribe the outside of the hole reducing breakout. Grooved hex shank prevents slipping in drill chuck or bit extension and fits all standard quick change chucks. Full cone threaded tip provides the speed needed to drill faster by pulling the bit through the material with Features a full cone threaded tip for fast drilling, contoured paddle for fast chip removal, hex shank power groove to reduce slippage and spur and reamer tips for cleaner holes. Use in applications such as drilling in hardwoods, composites, treated lumber, railroad ties and other wood products. Made of shock resistant tool steel for maximum durability. Hardened core for extra strength and reduced breakage and stripping. Heat treated to resist breakage and wear; 1/4" hex shank. For use with cordless or electric drills. For use in impact drivers and wrenches; industrial strength magnet maximizes fastener retention. Impact ready socket adapters can withstand up to 2000 in. lb. of torque; for high torque applications. Blue groove point and cutting edge for faster chip removal, double cutting spurs scribe the outside of the hole reducing breakout. Grooved hex shank prevents slipping in drill chuck or bit extension and fits all standard quick change chucks. For use with cordless or electric drills. Full cone threaded tip provides the speed needed to drill faster by pulling the bit through the material with Features a full cone threaded tip for fast drilling, contoured paddle for fast chip removal, hex shank power groove to reduce slippage and spur and reamer tips for cleaner holes. Use in applications such as drilling in hardwoods, composites, treated lumber, railroad ties and other wood products. Full cone threaded tip provides the speed needed to drill faster by pulling the bit through the material with Features a full cone threaded tip for fast drilling, contoured paddle for fast chip removal, hex shank power groove to reduce slippage and spur and reamer tips for cleaner holes. Use in applications such as drilling in hardwoods, composites, treated lumber, railroad ties and other wood products. Full cone threaded tip provides the speed needed to drill faster by pulling the bit through the material with Features a full cone threaded tip for fast drilling, contoured paddle for fast chip removal, hex shank power groove to reduce slippage and spur and reamer tips for cleaner holes. Use in applications such as drilling in hardwoods, composites, treated lumber, railroad ties and other wood products. Proprietary steel and heat treat process for maximum strength, durability and a strong magnetic tip for secure grip. Color coded band for easy size identification; 1/4" hex shank Lobular nutsetters are built for maximum durability, performance and long life with impact tools. Designed to drive the fastener from the side, rather than forcing the corners to turn, maintaining the true shape of the fastener and dramatically reducing breakage and damage from stripping. Also provides more clearance on the corners of the fastener where paint build-up often occurs. Black oxide finish resists corrosion to increase the life of the nutsetter. One-bit construction gives you the extra reach you need without screw extensions. Sharp cutting edge promotes easy wood boring, faster chip removal and reduced vibration. Double wing spurs allow for fast, clean hole cutting. Versatile 1/4" Quick change hex shank can be used in all universal Quik-Lok extensions. One-bit construction gives you the extra reach you need without screw extensions. Sharp cutting edge promotes easy wood boring, faster chip removal and reduced vibration. Double wing spurs allow for fast, clean hole cutting. Versatile 1/4" Quick change hex shank can be used in all universal Quik-Lok extensions. Lobular design reduces stripping damage by driving the fastener on the sides instead of forcing the corners to turn. Provides more clearance on the corners of the fastener. Used with sheet metal screws and other hexagonal head fasteners; 1/4" hex shank. One-bit construction gives you the extra reach you need without screw extensions. Sharp cutting edge promotes easy wood boring, faster chip removal and reduced vibration. Double wing spurs allow for fast, clean hole cutting. Versatile 1/4" Quick change hex shank can be used in all universal Quik-Lok extensions. Lobular nutsetters are built for maximum durability, performance and long life with impact tools. Designed to drive the fastener from the side, rather than forcing the corners to turn, maintaining the true shape of the fastener and dramatically reducing breakage and damage from stripping. Also provides more clearance on the corners of the fastener where paint build-up often occurs. Black oxide finish resists corrosion to increase the life of the nutsetter. Blue groove point and cutting edge for faster chip removal, double cutting spurs scribe the outside of the hole reducing breakout. Grooved hex shank prevents slipping in drill chuck or bit extension and fits all standard quick change chucks. Blue groove point and cutting edge for faster chip removal, double cutting spurs scribe the outside of the hole reducing breakout. Grooved hex shank prevents slipping in drill chuck or bit extension and fits all standard quick change chucks. Full cone threaded tip provides the speed needed to drill faster by pulling the bit through the material with Features a full cone threaded tip for fast drilling, contoured paddle for fast chip removal, hex shank power groove to reduce slippage and spur and reamer tips for cleaner holes. Use in applications such as drilling in hardwoods, composites, treated lumber, railroad ties and other wood products. For use with cordless or electric drills. Lobular design drives fastener on side instead of corner for less stripping and longer life. Rare earth magnets hold fasteners securely with four times the hold of standard magnets. 1/4" quick-change shank is designed to work with impact drivers and reduces slipping in standard drill chucks. Proprietary steel and heat treat process for maximum strength, durability and a strong magnetic tip for secure grip. Color coded band for easy size identification; 1/4" hex shank One-bit construction gives you the extra reach you need without screw extensions. Sharp cutting edge promotes easy wood boring, faster chip removal and reduced vibration. Double wing spurs allow for fast, clean hole cutting. Versatile 1/4" Quick change hex shank can be used in all universal Quik-Lok extensions. One-bit construction gives you the extra reach you need without screw extensions. Sharp cutting edge promotes easy wood boring, faster chip removal and reduced vibration. Double wing spurs allow for fast, clean hole cutting. Versatile 1/4" Quick change hex shank can be used in all universal Quik-Lok extensions. For use in impact drivers and wrenches; industrial strength magnet maximizes fastener retention. Impact ready socket adapters can withstand up to 2000 in. lb. of torque; for high torque applications. Precision ground spade bit points drill clean holes in applications such as wood or composition board. Heavy duty hex shank prevents slipping and fits all 1/4" quick change systems; hole for bit storage and wire pulling. Blue groove point and cutting edge for faster chip removal, double cutting spurs scribe the outside of the hole reducing breakout. Grooved hex shank prevents slipping in drill chuck or bit extension and fits all standard quick change chucks. Blue groove point and cutting edge for faster chip removal, double cutting spurs scribe the outside of the hole reducing breakout. Grooved hex shank prevents slipping in drill chuck or bit extension and fits all standard quick change chucks. Lobular design reduces stripping damage by driving the fastener on the sides instead of forcing the corners to turn. Provides more clearance on the corners of the fastener. Used with sheet metal screws and other hexagonal head fasteners; 1/4" hex shank. Proprietary steel and heat treat process for maximum strength, durability and a strong magnetic tip for secure grip. Color coded band for easy size identification; 1/4" hex shank One-bit construction gives you the extra reach you need without screw extensions. Sharp cutting edge promotes easy wood boring, faster chip removal and reduced vibration. Double wing spurs allow for fast, clean hole cutting. Versatile 1/4" Quick change hex shank can be used in all universal Quik-Lok extensions. Heat treated shaft resists bending under heavy loads. Angle dimples scoop the wood to drill cleaner and faster than conventional spade bits. Precision ground spade bit points drill clean holes in applications such as wood or composition board. Heavy duty hex shank prevents slipping and fits all 1/4" quick change systems; hole for bit storage and wire pulling. Lobular design reduces stripping damage by driving the fastener on the sides instead of forcing the corners to turn. Provides more clearance on the corners of the fastener. Used with sheet metal screws and other hexagonal head fasteners; 1/4" hex shank. Made of shock resistant tool steel for maximum durability. Hardened core for extra strength and reduced breakage and stripping. Heat treated to resist breakage and wear; 1/4" hex shank. Proprietary steel and heat treat process for maximum strength, durability and a strong magnetic tip for secure grip. Color coded band for easy size identification; 1/4" hex shank Lobular design reduces stripping damage by driving the fastener on the sides instead of forcing the corners to turn. Provides more clearance on the corners of the fastener. Used with sheet metal screws and other hexagonal head fasteners; 1/4" hex shank. Precision ground spade bit points drill clean holes in applications such as wood or composition board. Heavy duty hex shank prevents slipping and fits all 1/4" quick change systems; hole for bit storage and wire pulling. Irwin Impact Nutsetter, Magnetic, Series: 1899935, 1/2 in Drive, 1/4 in Shank, 1-7/8 in Overall Length, Tool Steel, Black Oxide Blue groove point and cutting edge for faster chip removal, double cutting spurs scribe the outside of the hole reducing breakout. Grooved hex shank prevents slipping in drill chuck or bit extension and fits all standard quick change chucks. Lobular nutsetters are built for maximum durability, performance and long life with impact tools. Designed to drive the fastener from the side, rather than forcing the corners to turn, maintaining the true shape of the fastener and dramatically reducing breakage and damage from stripping. Also provides more clearance on the corners of the fastener where paint build-up often occurs. Black oxide finish resists corrosion to increase the life of the nutsetter. Engineered for extreme durability and longer life. Made from proprietary steel and heat treated to control hardness. Features a powerful magnet allowing for a secure grip and unyielding bit engagement. The bits feature color-coded rings for quick and easy size identification and a chamfered edge to allow for fastening in tight spaces. Designed for use with Milwaukee Shockwave Magnetic Bit Tip Holders 2.36", 3", 6" 12", 30? Knuckle Pivoting Bit Holder and all bit tip holders. Lobular design reduces stripping damage by driving the fastener on the sides instead of forcing the corners to turn. Provides more clearance on the corners of the fastener. Used with sheet metal screws and other hexagonal head fasteners; 1/4" hex shank. Blue groove point and cutting edge for faster chip removal, double cutting spurs scribe the outside of the hole reducing breakout. Grooved hex shank prevents slipping in drill chuck or bit extension and fits all standard quick change chucks. Provides users with the best in class speed and ease of use. Full cone threaded tip for fast and effortless drilling. Spur and reamer provide cleaner holes. Contoured paddle for faster chip removal. Hex shank with power groove reduces slippage. Proprietary steel and heat treat process for maximum strength, durability and a strong magnetic tip for secure grip. Color coded band for easy size identification; 1/4" hex shank Lobular design reduces stripping damage by driving the fastener on the sides instead of forcing the corners to turn. Provides more clearance on the corners of the fastener. Used with sheet metal screws and other hexagonal head fasteners; 1/4" hex shank. Proprietary steel and heat treat process for maximum strength, durability and a strong magnetic tip for secure grip. Color coded band for easy size identification; 1/4" hex shank Lobular design reduces stripping damage by driving the fastener on the sides instead of forcing the corners to turn. Provides more clearance on the corners of the fastener. Used with sheet metal screws and other hexagonal head fasteners; 1/4" hex shank. Provides users with the best in class speed and ease of use. Full cone threaded tip for fast and effortless drilling. Spur and reamer provide cleaner holes. Contoured paddle for faster chip removal. Hex shank with power groove reduces slippage. Removes build-up. Push up to clean. For use in impact drivers and wrenches; industrial strength magnet maximizes fastener retention. Impact ready socket adapters can withstand up to 2000 in. lb. of torque; for high torque applications. Blue groove point and cutting edge for faster chip removal, double cutting spurs scribe the outside of the hole reducing breakout. Grooved hex shank prevents slipping in drill chuck or bit extension and fits all standard quick change chucks. Blue groove point and cutting edge for faster chip removal, double cutting spurs scribe the outside of the hole reducing breakout. Grooved hex shank prevents slipping in drill chuck or bit extension and fits all standard quick change chucks. Proprietary steel and heat treat process for maximum strength, durability and a strong magnetic tip for secure grip. Color coded band for easy size identification; 1/4" hex shank Provides users with the best in class speed and ease of use. Full cone threaded tip for fast and effortless drilling. Spur and reamer provide cleaner holes. Contoured paddle for faster chip removal. Hex shank with power groove reduces slippage. One-bit construction gives you the extra reach you need without screw extensions. Sharp cutting edge promotes easy wood boring, faster chip removal and reduced vibration. Double wing spurs allow for fast, clean hole cutting. Versatile 1/4" Quick change hex shank can be used in all universal Quik-Lok extensions. Proprietary steel and heat treat process for maximum strength, durability and a strong magnetic tip for secure grip. Color coded band for easy size identification; 1/4" hex shank Removes build-up. Push up to clean. One-bit construction gives you the extra reach you need without screw extensions. Sharp cutting edge promotes easy wood boring, faster chip removal and reduced vibration. Double wing spurs allow for fast, clean hole cutting. Versatile 1/4" Quick change hex shank can be used in all universal Quik-Lok extensions. Starts the bit cleanly on uneven surfaces and bores smooth, flat bottomed holes; fits 3/8" and larger drills and drill presses. Starts the bit cleanly on uneven surfaces and bores smooth, flat bottomed holes; fits 3/8" and larger drills and drill presses. For use with sheet metal screws and other hexagonal head fasteners; 5/16 hex shank. One-bit construction gives you the extra reach you need without screw extensions. Sharp cutting edge promotes easy wood boring, faster chip removal and reduced vibration. Double wing spurs allow for fast, clean hole cutting. Versatile 1/4" Quick change hex shank can be used in all universal Quik-Lok extensions. One-bit construction gives you the extra reach you need without screw extensions. Sharp cutting edge promotes easy wood boring, faster chip removal and reduced vibration. Double wing spurs allow for fast, clean hole cutting. 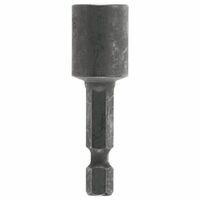 Versatile 1/4" Quick change hex shank can be used in all universal Quik-Lok extensions. Starts the bit cleanly on uneven surfaces and bores smooth, flat bottomed holes; fits 3/8" and larger drills and drill presses. For use with 3/8" shank bits. Includes hex key. Provides users with the best in class speed and ease of use. Full cone threaded tip for fast and effortless drilling. Spur and reamer provide cleaner holes. Contoured paddle for faster chip removal. Hex shank with power groove reduces slippage. Razor sharp serrated edge for fast and flawless cutting, 3-1/2", hardened steel body for longer life, ultra sharp spur to ensure an accurate starting hole, steep angled cutting edge to produce chisel-like curls, forged construction for extended life. Razor sharp serrated edge for fast and flawless cutting, 3-1/2", hardened steel body for longer life, ultra sharp spur to ensure an accurate starting hole, steep angled cutting edge to produce chisel-like curls, forged construction for extended life. Lobular nutsetters are built for maximum durability, performance and long life with impact tools. Designed to drive the fastener from the side, rather than forcing the corners to turn, maintaining the true shape of the fastener and dramatically reducing breakage and damage from stripping. Also provides more clearance on the corners of the fastener where paint build-up often occurs. Black oxide finish resists corrosion to increase the life of the nutsetter. Starts the bit cleanly on uneven surfaces and bores smooth, flat bottomed holes; fits 3/8" and larger drills and drill presses. Starts the bit cleanly on uneven surfaces and bores smooth, flat bottomed holes; fits 3/8" and larger drills and drill presses. Lobular nutsetters are built for maximum durability, performance and long life with impact tools. Designed to drive the fastener from the side, rather than forcing the corners to turn, maintaining the true shape of the fastener and dramatically reducing breakage and damage from stripping. Also provides more clearance on the corners of the fastener where paint build-up often occurs. Black oxide finish resists corrosion to increase the life of the nutsetter. Removes build-up. Push up to clean. Starts the bit cleanly on uneven surfaces and bores smooth, flat bottomed holes; fits 3/8" and larger drills and drill presses. Razor sharp serrated edge for fast and flawless cutting, 3-1/2", hardened steel body for longer life, ultra sharp spur to ensure an accurate starting hole, steep angled cutting edge to produce chisel-like curls, forged construction for extended life. Removes build-up. Push up to clean. Lobular nutsetters are built for maximum durability, performance and long life with impact tools. Designed to drive the fastener from the side, rather than forcing the corners to turn, maintaining the true shape of the fastener and dramatically reducing breakage and damage from stripping. Also provides more clearance on the corners of the fastener where paint build-up often occurs. Black oxide finish resists corrosion to increase the life of the nutsetter. Includes 5 feed screws, hex key 3 set screws. For self-feed bits up to 2-9/16". Made from proprietary steel and heat treat process for maximum strength and durability. Thin wall construction for easy access in tight spaces. 6 point deep wells for unyielding bit engagement. Set includes: (1) 1/2" Shockwave Impact Socket, (1) 9/16" Shockwave Impact Socket and (1) 3/8" Socket Adapter. Irwin Impact Nutsetter, Magnetic, Series: 1899938, 1/2 in Drive, 1/4 in Shank, 6 in Overall Length, Tool Steel, Black Oxide Razor sharp serrated edge for fast and flawless cutting, 3-1/2", hardened steel body for longer life, ultra sharp spur to ensure an accurate starting hole, steep angled cutting edge to produce chisel-like curls, forged construction for extended life. Starts the bit cleanly on uneven surfaces and bores smooth, flat bottomed holes; fits 3/8" and larger drills and drill presses. Razor sharp serrated edge for fast and flawless cutting, 3-1/2", hardened steel body for longer life, ultra sharp spur to ensure an accurate starting hole, steep angled cutting edge to produce chisel-like curls, forged construction for extended life. Made of shock-resistant and heat treated S2 steel for maximum strength and hardness. Positive retention of the screw improves installation rate. Universal 1/4" hex shank fits most power tools and quick-change chuck adapters. For use with sheet metal screws and other hexagonal head fastener. Standard six-point design. Starts the bit cleanly on uneven surfaces and bores smooth, flat bottomed holes; fits 3/8" and larger drills and drill presses. Razor sharp serrated edge for fast and flawless cutting, 3-1/2", hardened steel body for longer life, ultra sharp spur to ensure an accurate starting hole, steep angled cutting edge to produce chisel-like curls, forged construction for extended life. Made from proprietary steel and heat treat process for maximum strength and durability. Thin wall construction for easy access in tight spaces. 6 point deep wells for unyielding bit engagement. Starts the bit cleanly on uneven surfaces and bores smooth, flat bottomed holes; fits 3/8" and larger drills and drill presses. Corrosion resistant coating helps prevent rusting. Precision ground teeth for smooth, accurate cuts; slots for straighter cuts. Razor sharp serrated edge for fast and flawless cutting, 3-1/2", hardened steel body for longer life, ultra sharp spur to ensure an accurate starting hole, steep angled cutting edge to produce chisel-like curls, forged construction for extended life. Razor sharp serrated edge for fast and flawless cutting, 3-1/2", hardened steel body for longer life, ultra sharp spur to ensure an accurate starting hole, steep angled cutting edge to produce chisel-like curls, forged construction for extended life. Razor sharp serrated edge for fast and flawless cutting, 3-1/2", hardened steel body for longer life, ultra sharp spur to ensure an accurate starting hole, steep angled cutting edge to produce chisel-like curls, forged construction for extended life. Thin kerf .076", for fast, smooth cuts and exclusive wedge shoulder for increased durability. Ribbed heat vents eliminate blade flexing and binding for long lasting performance. ATB tooth design, plate, .050", +20 hook angle. For general construction applications, including fast, efficient ripping and crosscutting. Cuts rough framing lumber, high quality finish lumber, plywood, OSB, and hardboard siding. .094" thin kerf design. 15-degree hook angle. 9,000 max RPM. Starts the bit cleanly on uneven surfaces and bores smooth, flat bottomed holes; fits 3/8" and larger drills and drill presses. Made of shock-resistant and heat treated S2 steel for maximum strength and hardness; magnets are four times more powerful than common magnets. Positive retention of the screw improves installation rate. Universal 1/4" hex shank fits most power tools and quick-change chuck adapters. For use with sheet metal screws and other hexagonal head fasteners. Made of shock-resistant and heat treated S2 steel for maximum strength and hardness. Positive retention of the screw improves installation rate. Universal 1/4" hex shank fits most power tools and quick-change chuck adapters. For use with sheet metal screws and other hexagonal head fastener. Standard six-point design. Triple-sharp teeth for smooth cuts and excellent finish. Extra-hard steel plate resists bending and deflection. Stays sharper longer and resists impact damage. Body slots reduce heat for true running. Speed Coat finish means less friction and pitch build-up for fast, effortless cutting. Tooth pitch is 5/8" per tooth inch, increasing the speed of chip removal while making smoother, more precise cuts. Max rpm 7,000. Thin kerf, .083", saw blade for miter saws and table saws. Construction grade carbide teeth for longer life; #400 grit diamond ground teeth for a smooth finish. Alternate top bevel, 20 degree hook angle, and max rpm 7,300. Starts the bit cleanly on uneven surfaces and bores smooth, flat bottomed holes; fits 3/8" and larger drills and drill presses. Made of shock-resistant and heat treated S2 steel for maximum strength and hardness; magnets are four times more powerful than common magnets. Positive retention of the screw improves installation rate. Universal 1/4" hex shank fits most power tools and quick-change chuck adapters. For use with sheet metal screws and other hexagonal head fasteners. Razor sharp serrated edge for fast and flawless cutting, 3-1/2", hardened steel body for longer life, ultra sharp spur to ensure an accurate starting hole, steep angled cutting edge to produce chisel-like curls, forged construction for extended life. Made of shock-resistant and heat treated S2 steel for maximum strength and hardness; magnets are four times more powerful than common magnets. Positive retention of the screw improves installation rate. Universal 1/4" hex shank fits most power tools and quick-change chuck adapters. For use with sheet metal screws and other hexagonal head fasteners. 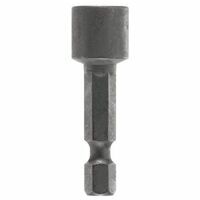 Irwin Impact Nutsetter, Magnetic, Series: 1899939, 1/2 in Drive, 1/4 in Shank, 12 in Overall Length, Tool Steel, Black Oxide Starts the bit cleanly on uneven surfaces and bores smooth, flat bottomed holes; fits 3/8" and larger drills and drill presses. Starts the bit cleanly on uneven surfaces and bores smooth, flat bottomed holes; fits 3/8" and larger drills and drill presses. Made of shock-resistant and heat treated S2 steel for maximum strength and hardness; magnets are four times more powerful than common magnets. Positive retention of the screw improves installation rate. Universal 1/4" hex shank fits most power tools and quick-change chuck adapters. For use with sheet metal screws and other hexagonal head fasteners. Starts the bit cleanly on uneven surfaces and bores smooth, flat bottomed holes; fits 3/8" and larger drills and drill presses. Razor sharp serrated edge for fast and flawless cutting, 3-1/2", hardened steel body for longer life, ultra sharp spur to ensure an accurate starting hole, steep angled cutting edge to produce chisel-like curls, forged construction for extended life. Starts the bit cleanly on uneven surfaces and bores smooth, flat bottomed holes; fits 3/8" and larger drills and drill presses. Made of shock-resistant and heat treated S2 steel for maximum strength and hardness; magnets are four times more powerful than common magnets. Positive retention of the screw improves installation rate. Universal 1/4" hex shank fits most power tools and quick-change chuck adapters. For use with sheet metal screws and other hexagonal head fasteners. Marathon with WeldTec Miter/Table saw blade are precision engineered to deliver long life and durability without sacrificing speed of cut. Made in Italy, these blades feature exclusive welded carbide teeth for strength. The heat resistant non-stick coating reduces binding and gumming so the blade runs cooler and deliver cleaner, truer cuts. Laser cut with expansion control slots to reduce warping and vibration. Ultra thin kerf with welded carbide teeth. Ring tensioned to maintain balance for straighter cuts. Razor sharp serrated edge for fast and flawless cutting, 3-1/2", hardened steel body for longer life, ultra sharp spur to ensure an accurate starting hole, steep angled cutting edge to produce chisel-like curls, forged construction for extended life. Made of shock-resistant and heat treated S2 steel for maximum strength and hardness; magnets are four times more powerful than common magnets. Positive retention of the screw improves installation rate. 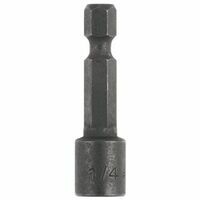 Universal 1/4" hex shank fits most power tools and quick-change chuck adapters. For use with sheet metal screws and other hexagonal head fasteners. Made of shock-resistant and heat treated S2 steel for maximum strength and hardness. Positive retention of the screw improves installation rate. Universal 1/4" hex shank fits most power tools and quick-change chuck adapters. For use with sheet metal screws and other hexagonal head fastener. Standard six-point design. Removable and replaceable feed screw, cutting edges can be resharpened; 7/16" hex shank has flat surfaces for secure chuck grip. Used by electricians and plumbers in applications such as large hole drilling in wood. Includes: (2) two feed screws with each bit. Removable and replaceable feed screw, cutting edges can be resharpened; 7/16" hex shank has flat surfaces for secure chuck grip. Used by electricians and plumbers in applications such as large hole drilling in wood. Includes: (2) two feed screws with each bit. Removable and replaceable feed screw, cutting edges can be resharpened; 7/16" hex shank has flat surfaces for secure chuck grip. Used by electricians and plumbers in applications such as large hole drilling in wood. Includes: (2) two feed screws with each bit. Removable and replaceable feed screw, cutting edges can be resharpened; 7/16" hex shank has flat surfaces for secure chuck grip. Used by electricians and plumbers in applications such as large hole drilling in wood. Includes: (2) two feed screws with each bit. Razor sharp serrated edge for fast and flawless cutting, 3-1/2", hardened steel body for longer life, ultra sharp spur to ensure an accurate starting hole, steep angled cutting edge to produce chisel-like curls, forged construction for extended life. Feed screws has a coarse thread for fast boring. Spurs on the outside diameter cut holes clearly and accurately; 7/16" Quick Change impact shank for use in applications such as large diameter holes in wood for pipe, conduit. Includes: Each bit is packaged with one hex key and two feed screws. Lobular design reduces stripping damage by driving the fastener on the sides instead of forcing the corners to turn. Provides more clearance on the corners of the fastener. Used with sheet metal screws and other hexagonal head fasteners; 1/4" hex shank. Adjustable cutting blade bores a variety of hole sizes. Cuts 19 size holes in increments of 1/8". Lockhead screw securely holds blade at desired boring diameter.